Replacing 12 fixture lights with LED pot lights. Took out all of our old lights and installed the first 4 pot lights and they worked. Installed the next 8 and would have a 5 second delay before the lighting circuit would trip after all the lights turned on. Disconnected those 8 lights, so that we had the original 4 that worked and again 5 second delay before they would trip. 11 watt lights which is way less than the bulbs we had in there before so it shouldn't be an overloaded circuit. Switched out the 15 amp breaker with a new one and would still get that 5 second delay before it would trip. Checked all the wiring at the switch and it was all good. Does anybody have any suggestions on what it could be? First is the breaker GFCI or AFCI? Is it fed off a circuit that also has receptacles? Are any of those GFCI receptacles? A GFCI or AFCI trip is indicative of that problem not necessarily an overcurrent. It is almost a cliche that when a protective device trips, people presume it is not exactly the condition the protective device is designed to trip for. And it usually is. The belief seems to be "ground faults happen to other people" therefore "any GFCI trip is a defective GFCI". Circuit breakers have published "trip curves" which indicate how long they take to trip at which currents. 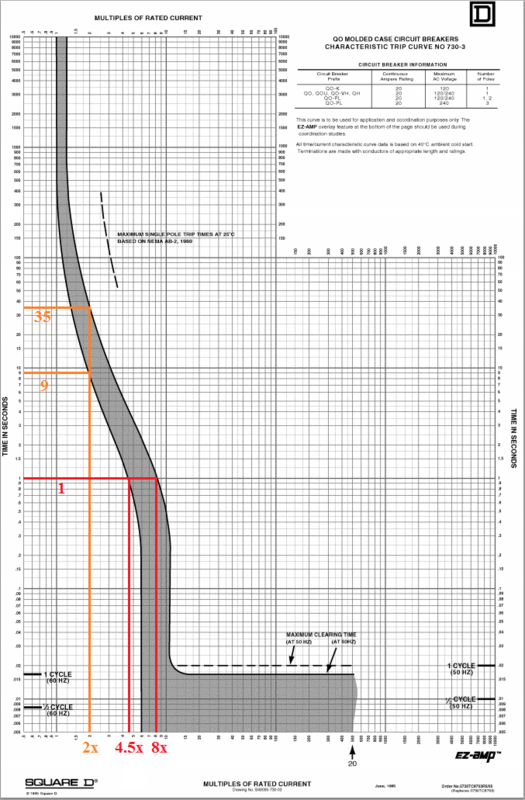 I just picked the trip curve for a random breaker I found online. Following the 5-second line, this breaker would trip between 2.5 and 4 times rated current, so in your case 37 to 60 amps, big arm-waving variance obviously, you didn't have a stopwatch. Or as much heat as a dryer. Something is making some heat, and these trips are preventing your house from burning down. The heat damage might be visible if you search for it. Unless the cable run is very long, a dead short would flow more current than that, more in the 100-500 amp range, and that would result in an instant (magnetic) trip. So we can probably exclude that. It could be a dead short impeded by the small wires commonly used in fixtures. It could also be a ground fault, returning through some part of the building not intended to be a ground path. The way to avoid that is make sure your grounds are tip-top. Any way you slice it, the answer is to slice it. Divide and conquer. Divide the circuit in half, see if the problem goes away, subdivide the culprit section, etc. etc. Not the answer you're looking for? Browse other questions tagged electrical lighting circuit-breaker or ask your own question. Why doesn't my replacement lighting work after my old fixture died? Circuit breaker keeps popping, how do I troubleshoot?